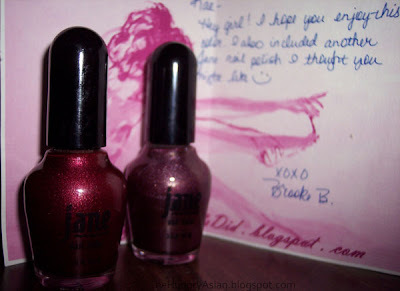 Home » jane » misc » Thank You Brooke! 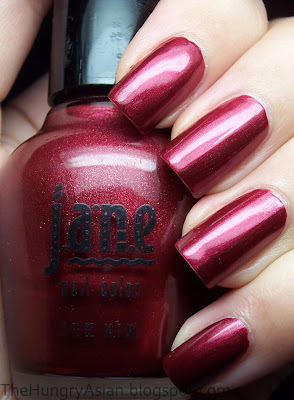 I recently found a couple of my old Jane polishes and showed them to you guys. Brooke from Getcha Nails Did saw the last one I posted, Rebellious, was low and offered to send me her bottle out of the kindness of her heart. I accepted and she not only sent me Rebellious, but another color called Infrared! Isn't this totally a color I would buy? Yes! Thank you Brooke so very much for sending me these, you are such a sweetie! Brooke is so sweet! Those are gorgeous colors! Now when you use those up, I don't know what your gonna do, lol! Very pretty Kae! Brooke is the sweetest. She's also keeping something from us. What is it? Have a nice weekend sweetie! Awww how sweet. Polish friends are the best kind of friends. Thank you so much, I hope you had a great weekend too! Thank you again! ♥ lol well I will pamper that last bottle and use sparingly so mabe never! Haha, me too I looove pink! I remember my sister having a super shimmery navy from Jane about ten yrs ago. She loved that color!